Race 3 song Selfish: In the voice of Atif Aslam and Salman’s close friend Iulia Vantur, the five-minute-long song is picturised on Jacqueline Fernandez, Salman and Bobby Deol. The soft number leaves you wondering about the narrative of the Remo D’Souza directorial. Race 3 is making the right amount of buzz among cinephiles. From its posters, trailer, behind the scene videos and songs, everything has left audiences’ heart racing. And now another song from the action-thriller titled “Selfish” has been released on Friday. What makes it special is its lyrics which have been penned by Dabangg Khan. 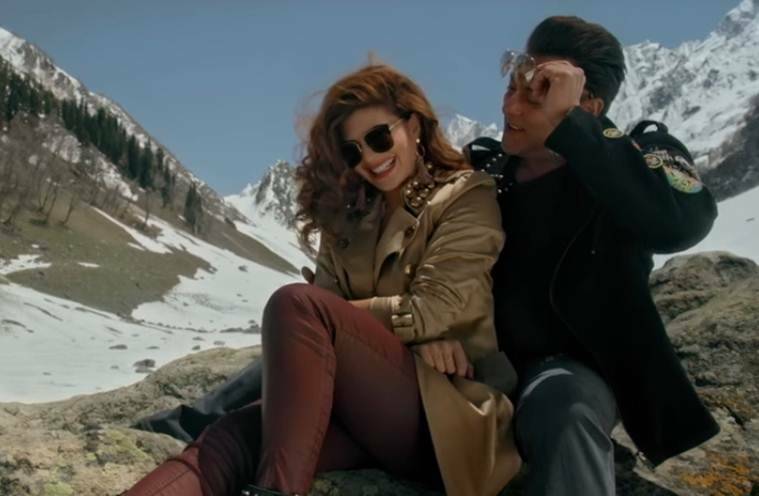 In the voice of Atif Aslam and Salman’s close friend Iulia Vantur, the five-minute-long song has been shot in the beautiful locales of Ladakh. Picturised on Jacqueline Fernandez, Salman and Bobby Deol, the soft number leaves you wondering about the narrative of the Remo D’Souza directorial. In one shot, Jacqueline aka Jessica is seen romancing Salman’s ‘Main Man’ Bobby and in others, she is sharing sizzling chemistry with Sikander (Salman). The song also features Daisy Shah and Saqib Saleem. Minus the hook line of the song, the song makes for a pleasant romantic number. Sharing the song, Salman tweeted, “Ek baar #Selfish hoke apne liye jiyo na . Song out now.” The actor teased the audience with a glimpse of Jacqueline from the song yesterday with the caption, “How chweet iz she lukin 🙂 @Asli_Jacqueline.” Bobby shared the song and said, “Passionate hearts will be set on fire with #Selfish.” Anil Kapoor, who plays a crucial role in the movie, wrote that the song “Selfish” ‘will leave you love-sick’. #Selfish will leave you love-sick! @BeingSalmanKhan @Asli_Jacqueline @thedeol! Song out now on @tipsofficial http://bit.ly/SelfishOfficialSong …. With the #DusKaDum team listening to the #Race3 #Selfish song . Song out noon yaane 12 baje . Samjhe! Salman Khan and Jacqueline Fernandez share a sizzling chemistry in Race 3. Bobby Deol and Jacqueline Fernandez romance each other in the Race 3 song Selfish. A still from the Selfish song starring Jacqueline Fernandez. Bobby Deol in Race 3 A still from the song Selfish starring Daisy Shah. The third installment of the Race franchise, Race 3, will hit the screens on June 15.